Our Dolce™ Throws have gone mod! Knitted with the word LOVE, in the softest feather yarn available, this throw blanket is super cozy and silky. 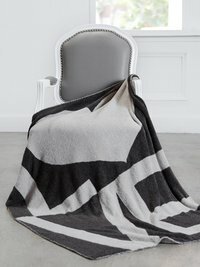 Available in two reversible color ways, the jacquard LOVE throw personalizes and complements your style. Wrap yourself up in LOVE. This throw is everything. Soft, cozy, comforting, and has the word Love on it. I gave it to my friend who is in the hospital. I think it will help heal her! Love this throw. I bought it for me and both of my kids want it. Guess i'm buying 2 more. Wish they had more colors.